What will stop the Rain from coming in? What will stop the Critters from coming in? Will the rain keep the dryer lint from starting a house fire? 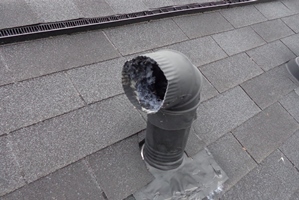 It is great that these homeowners extended their dryer vent to exit the attic yet there is a major fail here. They make proper tops for these vents and this unfortunately is not one. Without a cover as you can see there is room for lots of intrusion here. Great find by Fort Worth Home Inspector, Paul Viveros. Realty Inspection Services strives to make sure that all home buyers have all the information they need to make an informed home buying decision.